Hay and silage are sun-dried products. Over time, their nutritional value decreases and may develop fungi due to excessive moisture. An alternative to sun-dried products is artificially dried roughage, such as Hartog Lucerne-mix, Gras-mix and Compact Grass. The special grain mixture for this is dried by rapid temperature treatment, resulting in rapid preservation. This keeps preserving nutrients, vitamins and minerals better. Temperature treatment destroys bacteria and fungi, the product has a constant quality and is prolonged shelf life. When the quality of the roughage is very good, you can even save on concentrates. The quality of the roughage ration can be upgraded by feeding Compact Grass, which is 100% artificially dried grass. It is dust-free, mold free and guaranteed to be free from Jacobs Herbicide. Lucerne-mix can even replace (a large amount of) concentrate feed due to the large amount of vitamins, minerals and trace elements in the lucerne mix. The Lucerne mix also reduces the sugar content in the total ration. In concentrate, 25 to 40 percent sugar and starch, while in Lucerne mix contains only ten percent sugar and starch, it’s less than in hay or silage! Recent research has shown that after half a year a lot of vitamin loss occurs in hay, which can even rise to 5% per month under ideal conditions. Especially the vitamin E content drops quite quickly during the winter period. On the other side, Vitamin E in Lucerne-mix and Compact Grass stays well present. Especially in the Lucerne mix, there is a high content of vitamins, including vitamin E. Concentrate feed can not always compensate for the shortage of roughage or roughage feeders. The quantities to be exported are then too large and the balance between roughage and concentrate feeders is disturbed. 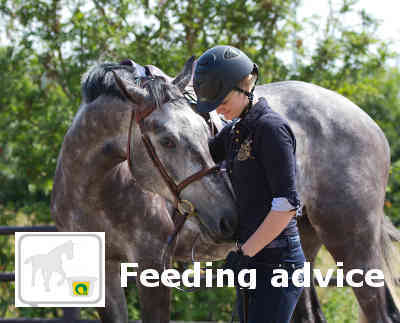 After all, the roughage is the basis of the ration and should provide the horse with the basic need in nutrients while concentrate feed is mainly used for a performance. For example, for the sports, pregnancy, lactation period of the mare or a horse in the growth phase. The levels of vitamins, minerals and trace elements are naturally formed in Luzerne, leaving them sufficient enough to meet the basic needs of the horse. "Amber Koppen and Bas de Recht van Paarden Revalidatiecentrum Equiscio in Ter Apel:"We benefit from a consistent quality of roughage and therefore chose Hartog Lucerne with cutter. Lucerne is known for its very low sugar content, and it is much richer in vitamins, minerals and essential trace elements than, for example, silage or grass. Our horses and patients are doing very well and need little strength. Strikingly, our horses are relatively few manure, which indicates a good digestive coefficient. Sander Marijnissen: "We carry Hartog Compact Grass, because we find good roughage for the horse very important for digestion, but also for the overall well-being of the horse. Previously we used to grow grass. Here we had molds regularly. We threw it away on the manure, and that's a pity. The continuous availability of dried grass is good for horse welfare and prevents gastric ulcers and bowel disorders. "